In the years before the BAT-Tilling rift in 1942, the Maidstone & District company developed quite a liking for the Bristol double deck chassis. Initially, the GO5G type was tried, 12 going to the main fleet and 4 to the Chatham & District subsidiary in 1936. They did not impress. The bodies were removed in 1938 and the chassis were sold on to Bristol Tramways. Despite this inauspicious start, Chatham & District then took 41 with highbridge bodies and Maidstone & District 12 with lowbridge bodies of the new K5G type from the end of 1938 up to the outbreak of war in September 1939. When Tilling and BET split, Tilling group fleets retained the policy of standardising on Bristol/ECW machinery, whilst the BET companies sourced their vehicles from various manufacturers. However, the exigencies of wartime production did not grant the indulgence of much choice in such matters and operators largely had to take what they were given, though the Tilling companies preferred to minimise their intake of non Bristol double deck machinery. Nevertheless, Chatham and District managed to obtain 5 and Maidstone & District 7 examples of the total of 85 unfrozen K5G buses produced in 1942. Towards the end of the war, matters were relaxed to a certain degree, and, within the limitations on offer, operators were able to express a preference for the model that best fitted into the fleet profile, though this was not always heeded by the authorities. During and immediately after the war, the Bristol concern produced a limited number of utility K type buses in three sanctions, but these lost the 5LW engine in favour of the 6 cylinder AEC A202, a version of the 7.7 (actually of 7.58 litres) specifically designed to fit in place of the Gardner. The W1 sanction consisted of 150 chassis, the W2 of 100, and W3 of 200. The W1 and W2 sanctions were equipped with the earlier style of high mounted radiator, but the W3 buses had the new lower mounted PV2 bonnet and radiator. Maidstone and District became an enthusiastic operator, accepting 30 of W1, 19 of W2 and 5 of W3. After the war, Maidstone and District continued to take deliveries of the K6A until the sale of the Bristol company to the government led to the withdrawal of that make from the open market. In recognition of the qualities of the Bristol chassis, Maidstone & District embarked upon a rebodying programme for the unfrozen K5G and utility K6A fleet, but the pre war examples were sold out of service in the mid 1950s. The rebodied K5Gs retained their high mounted radiators, but the rebodied W1 and W2 sanctions of K6As were fitted with the low mounted PV2 radiator. In most cases, new H30/26R bodywork of very attractive design was supplied by Weymann, but the later rebuilds received the decidedly less appealing Orion type. Curiously, many of the later buses of 1946/7/8, which retained their original bodywork to the end, were sold out of service earlier than the rebodied wartime machines. The photograph above shows chassis number W2.038, DH 152, HKE 860 of 1945 with a PV2 radiator and Weymann H30/26R body that replaced the original high radiator and Duple H30/26R in May 1953. It is seen in Tonbridge in 1960 on its way to the village of East Peckham, once a major centre of the hop growing industry. This bus stayed in the Maidstone and District fleet until 1966. 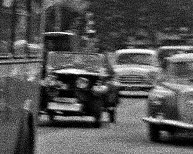 Sadly the limitations of the Comet S camera lens prevent me from identifying the splendid car following the bus. What a fantastic shot. The long since built over Tonbridge Garage had several examples of these old Bristols which seemed to have been used to cover just about anything (at Tunbridge Wells they had distinct allocations). Route 88 was allocated OMO Reliances and provided a useful connection to the nearest major hospital at Pembery, and connected with route 33 at the East Peckham end of the route. On the offside is the road taken by Tonbridges regular Bristol allocation, Route 100, a 20 minute frequency town service with LL6A single deckers. Wonderful-looking decker, and I bet the reality was just as good as the appearance. I was momentarily fooled by the "East Peckham" destination and imagined that the bus was on hire to London Transport, but somehow the landscape seemed not to bear that out, so I googled E. Peckham and found it just to the west of the Paddock Wood–Maidstone railway line—the very line I hope to use to get to the SE Bus Festival on the 28th of March. Has any of our members been to this event, and if so how d’you rate it? The list of vehicles expected to attend looks very impressive. Last time I went to Maidstone was to see the trolleybuses before they disappeared, so I’m a bit out of date. Lovely photo and attractive bus. It was a very sensible conversion job by M&D. However, it always looks odd to me to see Bristol K’s without ECW bodies! There can’t have been a world of difference between the Bristol K6A and the AEC Regent II. Presumably the Bristol gearbox and transmission produced a somewhat different sound but surely the performance would have been similar? Is there anyone who has experience of driving both? IMO, the South East Bus Festival is definitely worth attending. The site is huge and features a perimeter road used by some of the vehicles to give rides to the public. The vehicles are not jammed in lines and there are good photographic opportunities. There is spacious covered accommodation for sales stalls and displays such as models, slide shows and there are talks by professional busmen – Roger Davies of Classic Bus fame has appeared, for example. Plenty of other vehicles such as lorries, tractors and classic cars are also on display. You can find a list of bus entries on the Arriva website and will see sister vehicle HKE 867 has been entered. It usually is on the free rides circuit so you should be able to sample it! One last bit of advice – wear warm clothing and bring your own refreshments! The site is on the top of the North Downs and can be breezy. I would also agree that the South East Bus Festival is worth attending. Where else can you have a ride on a pre-war Leyland Titan and the latest hybrid? Malcolm and Nigel: many thanks for you info and advice. The event sounds too good to miss. Chris B: I’ve never driven a K6A but I’ve been lucky enough to ride the very lively Thames Valley 446 (DBL 154). Bus engineer pal Graham Green of Reading reckons that the AEC 7.7 goes better in other makers’ vehicles than it does in AEC’s own. I’m sure the 5-speed gearbox in the Thames Valley K6A reinforces that impression. How does the Daimler CWA6 compare with the CWD6? My guess is that the Daimler engine’s 13% greater capacity gives little advantage in performance. The engine was rigidly mounted in both the K6A and the Regent II, but the mellow sounding Bristol constant mesh gearbox contrasted with the scream of the AEC straight cut gear D124 crash gearbox. Both types employed the triple servo braking system, and both, again, were noted for relatively light steering characteristics. The Daimler CD6 had a capacity of 8.6 litres and a nominal output of 100bhp at 1750 rpm, but the quality varied greatly between individual examples. Like the contemporary and even more problematical Crossley HOE7 engine of identical bore and stroke (copied from the pre war Leyland unit), it performed best in single deck chassis. However, OBP does have an expert who can give an informed opinion of the Daimler engine from personal experience. Please step forward Chris Youhill. Very interesting piece particularly as I once owned an ex Hants & Dorset 1945 K6A open topper fitted with an AEC engine (see my description under ‘Hants & Dorset 1945 Bristol K6A‘). 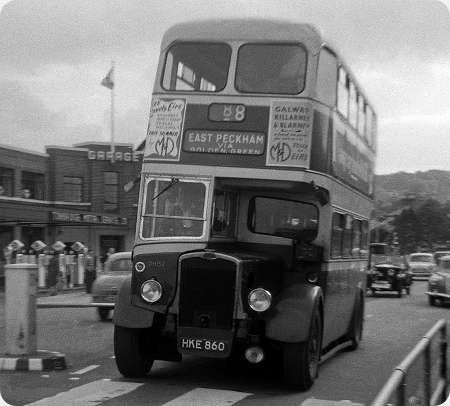 By the way, the touring car following the bus is almost certainly a Riley Nine from the early to mid 1930’s. I am sure that you are right about the Riley, John. On the first Sunday in October each year I travel down from East Anglia to the old Croydon Airport building for an ATC reunion. A fellow "old cadet" brings his splendid open tourer Riley Nine in British Racing Green. I plan to get one when I win the Lottery – not this week, sadly (can you believe that the same thing happened last week as well?!). Well done, John B, for identifying the car as a Riley Nine – my frustrations are over! There was always something special (and quirky) about Rileys, before the advent of ‘badge engineering’! Roger C – I’ve said before that I grew up in the Morden that was LTE’s Daimlerland post-war. I recall that on the front inside of the driver’s cab above the windscreen of D140 was the chalk message, "D140, the fastest D of them all". It was one of the dozen CWD’s in the 281-strong fleet. You could always tell the CWD’s from the CWA’s, because the inspection holes in the bonnet-sides of each type were in a different place. So there might have been some extra performance with them. Of course, any advantage disappeared when the engines were replaced by more driver/maintenance-friendly ex-STL AEC engines, around 1950! Just a note about the car identified above. It is a 1929/30 Riley Model 9 Tourer as you have recalled. It is an early car and is a desirable "Eligible" car for Vintage Sports Car Club membership events. In good condition they are a delight to drive as was/is my 1937 12/4 Falcon version! What is also interesting is the different styles of Weymann body fitted. The post war KKK Bristols (apart from one) had what was the post war equivalent of the pre war five bay Weymann body (similar to the LT post war STLs). Some of the HKE rebodyings had the same style. There then followed the 1951/2 version (as above) which had deeper windows. This style was also fitted to the rebodied Guys (again except one) and Daimlers as well as the high radiator Chatham Traction K5Gs. There then followed the 1953 four bay style (as exemplified by the preserved K6A) and then finally the Orion. The last two body styles were only fitted to the low radiator Bristol K6As. The LKT lowbridge Bristol K6As also had a lowbridge version of this style of bodywork fitted from new. All the vehicles were 7 foot 6 inches wide requiring a special narrow version of the Orion body. Maidstone Corporation’s No 43 registration NKK 243F was a rather rare combination of Massey body on the Leyland Atlantean PDR1/1 chassis with H43/31F seating being one of only thirty two rear engine chassis bodied by Massey Bros. Of this total Maidstone Corporation bought twenty all on Atlantean chassis No’s 27-46 and Colchester Corporation bought ten also on Atlantean No’s 45-54, the other two went to members of A1 Services of Ardrossan one on the only Daimler Fleetline chassis bodied by Massey which was followed by one on an Atlantean. All thirty two had the same seating layout as the photo’s subject. Several of Massey’s regular customers who bought from them on front engine chassis chose not to go to them when rear engines became the order of the day which possibly contributed to the later merger with Northern Counties. By 1968 most bodybuilders were producing bodies with a more shaped frontal aspect on rear engined chassis but to my eye this is quite an attractive functionally boxy body, aided by a simple but effective livery. I Worked for Connor & Graham, Easington East Yorkshire in 1982 and we had three of them, I was told he bought two and later the dealer phoned and gave the third one free, the bodywork was very sound as it was used on school run from Sunk Island to Withernsea and to Hull on Saturday, I left in 1983 I think they were Maidstone Corporation Nos 28,29 and 31. I agree with Ian, although boxlike, I thought the Massey design was quite attractive and far better looking than some other builders designs where curved or wrap-round windscreens were indiscriminately ‘grafted’ on leaving some real ‘hotch potch’ end results. The livery also helps. Tasteful, traditional and practical. Wigan had at least one AN68. Were there any more – for Wigan or anyone else? Northern Counties bought Massey Bros in 1967. The final Massey deliveries to Wigan Corporation were Titans FEK1-9F in early 1968. The first AN68s delivered to Wigan Corporation were NEK1-10K in August 1972. Ah. Right. Obviously NCME then. Not to a Massey outline by any chance? London Country borrowed six of these buses during a period of acute vehicle shortage in 1977. They were operated out of Chelsham Garage on the busy 403 group of services across Croydon to Wallington. I rode on several of these at the time, and noted the high standard of internal finish of the Massey bodies, but the PDR1/1 Atlantean did struggle a bit on the long gradient up to Sanderstead Church. In the mid 1960s, Massey double deck design went from the extremely curvaceous to the excessively angular. The Pemberton firm was very late entering the rear engined double deck bus market, and this application of the perpendicular was its eventual offering. 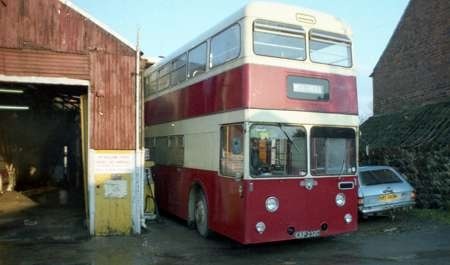 It would seem that, from then on, some structural componentry must have been common to rear engined and front engined double deck bus bodywork, because the latter type, hitherto very rounded, then became very squared up. It was as if the firm had become revitalised by memories of its markedly austere wartime utility designs. The bold angularity of these Atlanteans was not unattractive, but the vertical front screens must have given problems with internal reflections from the interior lighting during hours of darkness. I was never a convert to the insipid and rather grubby pale blue and cream livery. To my eye, the colours do not complement each other – the lighter colour would have looked better had it been white with black lining out – but Maidstone really should never have abandoned in the mid 1960s the magnificent ochre and cream livery that I recall adorning the trolleybuses when I was a child living in Kent during the late 1940s. Maidstone, once a proud operator, seemed to go progressively downhill in its metamorphosis from ‘Corporation’ through ‘Borough Council’ to the ultimate horror of ‘Boro’line’ with its truly ghastly blue and yellow, with red and white trim, so called "livery". When NCME took over Massey, they moved into the former Massey factory and some subsequent NCME bodies showed a marked Massey influence, particularly around the front of the upper deck. None were identical to past Massey products, however. There is a Leyland Atlantean with Massey body in Northern Ireland which is used as an "activity centre". The vehicle spends most of the year in under cover storage but has re-emerged this summer. It is devoid of any identity but can only be an ex Colchester or Maidstone example. Did any of the C&G ones go to Ireland, or can anyone reveal more about what this vehicle may be. 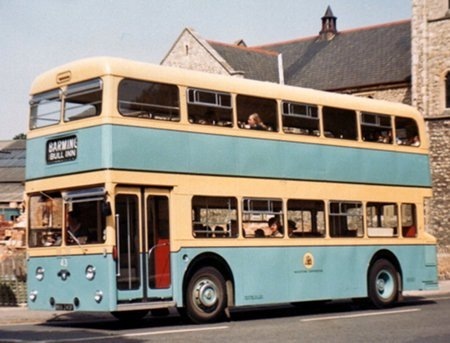 Did the identity of the Massey bodied Atlantean in Northern Ireland ever got established? I too liked the Massey bodied examples. They looked different from the Alexander, MCW, Roe, Northern counties etc.There aren’t many left. Bill Headley (above) says that the one in Northern Ireland is devoid of any identity, but it must carry a registration plate, if only a Northern Irish one. Perhaps it could be identified from that. How close is it possible to get to the said vehicle? There is likely to be some source of identification on it, somewhere.